That’s how many tomatoes Executive Chef Chris Weldon estimates he harvested this summer from the new kitchen garden at Stone Oak in Hilliard, Ohio. The garden, which sits about 30 paces back from the kitchen door, began with a few herbs planted among the residents’ garden on the back patio. 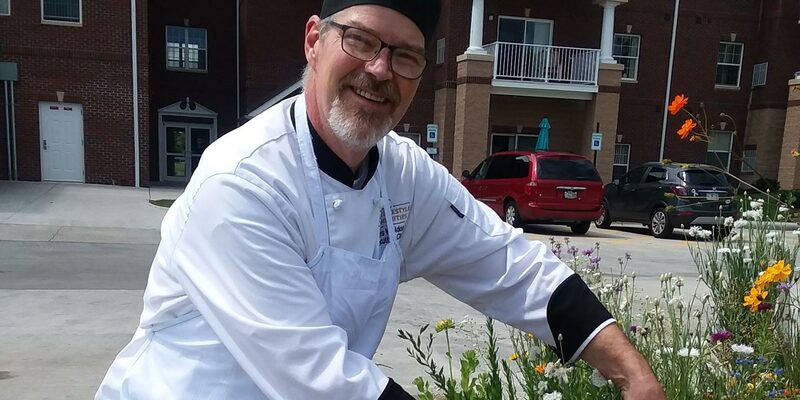 But at the end of last year, the residents and managers decided to give Chef Chris a garden of his own. The landscaping crew took up the sod and turned the dirt over. Then Chef Chris planted herbs and vegetables while a cadre of residents shared the toils of the weeding and the hoeing. This summer’s bounty meant fresh tomatoes frequently appeared on the menu in the dining room. The kitchen served the residents fresh salsa and Caprese salad a half dozen times apiece. There was also a crop of nasturtiums, edible flowers that tastes like radish. Chef Chris garnished various salads with these as well. The green-thumbed gardeners also grew rosemary, mint, thyme, oregano, parsley, cilantro, basil, tomatillos, and rhubarb. They chose to leave some of the crops to go wild for next year’s seedlings and to improve the soil for next year’s garden.